When I was thirteen I joined the circus. That may seem strange now, but then, in the nineteen thirties and the middle of the great depression, these things were possible. You see I lived with my widowed father, who, more often than not, was drunk, and violent with it. I wasn’t good at school work, or anything else according to my father. But there was one thing I knew I was good at, and that was acrobatics. I could cartwheel, summersault and tumble and turn with the best of them. In fact my agility came in handy as I dodged dad’s backhanders. Also when I was tumbling about I felt free, as though I was flying, and all my misery would disappear. Then the circus came to town. 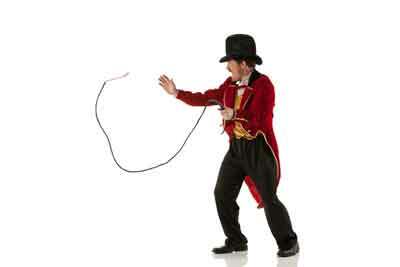 one person who really caught my imagination was the Ringmaster. He was dressed in a top hat and tails, and carried a very big whip that he cracked every now and then. He seemed to be able to pull all the acts together, while drawing the crowd into the wonder of the show, and I was instantly in awe of him. It was then that I knew I wanted to belong to all of this, and to earn the Ringmaster’s respect and love. And so the next day, as the circus was packing up to leave town, I presented myself to one of the crew and was directed to the foreman. I told him I wanted to go with them. “So, what can you do?” he asked. I told him about my acrobatic skills, and even demonstrated by doing a little routine I had devised just for the occasion. He thought for a minute or so, then said, “OK. You can start by mucking out the animal pens. Then we’ll see.” I was over the moon! I didn’t mind what I did so long as I was in the circus and out of home and away from dad. whom I often saw at a distance, but never dared approach. After all, he did carry a big whip. Eventually I got to perform. The experience was exhilarating! I felt so proud as the ringmaster announced our act, and when he announced that there was a new member of the troop, I thought my heart would burst with pride! One of the routines I loved involved flying though a tunnel of hoops. I would jump from a height onto a springboard and be catapulted through them. At first I started with two hoops, then over time, as I grew and became stronger and heavier, the number increased, until there were ten. And then they were set on fire, which made the act even more thrilling. And all the while I kept my eye on the Ringmaster, always looking for a sign of approval, but never daring to approach him. And then disaster struck. I guess my longing to please the Ringmaster passed into my body, so that I was tense, and that affected my flexibility, because during one practice session I landed awkwardly and broke my ankle. I was devastated – not only because I couldn’t perform what I loved doing the most, but that I couldn’t perform for the Ringmaster. What would he think of me? Would he let me stay in this community I loved, now that I couldn’t fly through the hoops? And I thought of that big whip he carried. All of these things went round and round in my mind as I lay in my caravan with my foot in plaster, not yet ready to even try out the crutches. My circus family was kind, and I had a number of visitors. The fat lady even baked me a cake, telling me that I was too skinny so my bones were fragile, and I just needed to put on a bit more weight. I thanked her politely, but doubted that it would solve my problem, even though the cake did turn out to be delicious. “Oh that.” he said, and smiled. “That’s only for effect. It wakes the audience up and keeps them on their toes. However, I must say that I’m pretty good at wielding it. You know I can flick a fly off the wall with my whip.” he said with a chuckle. I tried to take all this in, to see my father in a better light, but I couldn’t quite manage it. Well, my foot did heal, and quite quickly too. After some time I was back in the ring, leaping through my fiery hoops, and enjoying it even more than before, because I was no longer tense and could relax. I didn’t have to try and impress anybody, now that I knew the Ringmaster already approved of me.